Life is not a problem. But Life is full of them.Intelligent living is to know that Life’s problems cannot be wished away but have to be accepted. Problems can either be solved by you, by applying logic and intellect, or when you can’t solve them, you can allow them to be solved by Life, over time! Fundamentally, problems become simpler __ even if not easier __ to manage when you accept them. But if you keep denying that there is a problem, then you are creating a conflict with both the problem and within yourself. Because one part of you is forcing you to see the problem and accept it. While another part is forcing you to deny its existence. Out of this denial, fear and insecurity is born. Denial itself stems from lack of awareness. Denial is when you are arguing with Life. You are arguing because you expect Life to be fair, and so you believe that nothing “out-of-the-ordinary” is going to happen to you. But the truth may well be that “it” has happened to you. Why deny what has happened? 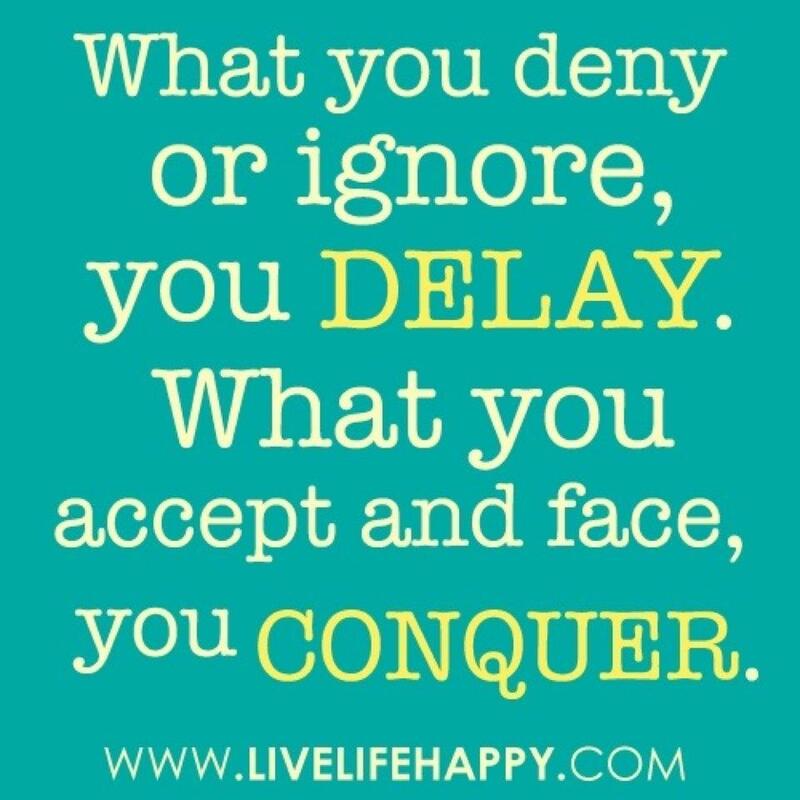 Denial is not going to make a problem go away. In fact, it will breed fear, which itself is then a new problem to deal with. Of course, accepting a problem is not going to make it disappear. But acceptance at least makes you peaceful – and through that inner peace, your ability to deal with the problem, or attempt solutions, is enhanced. Let’s say, someone is finding no joy in her marriage. She suspects that her spouse is not “involved” in their Life anymore. But she continues to brush that thought away and “endures” the marriage. How happy do you think she will be? Her acceptance of the problem may or may not make the marriage any better, but will surely make her peaceful. This is not just true in this lady’s context, it applies to every situation in Life. We create more problems for ourselves, in most situations, by wanting things to be different from what they are. Instead simply accept. Acceptance is empowering and liberating. While it may not make Life’s problems go away, it certainly enhances your ability to deal with them! Why Total Surrender to Life is the most intelligent thing to do! On the path to Bliss, total surrender to Life is what works ultimately! But the fickle human mind tries to obsess with methods and practices __ hoping to find a way out. Because the mind is reminding you__and me__that it is in control. The mind is the biggest charlatan. And it revels in controlling you. This is nothing but your ego at work. You have a relationship issue, the mind says it can solve it. You have a health issue, it says it can solve it too. You have a financial crisis, the mind says there’s a way out. And so the mind goes on, dragging you from hope to despair and back, holding you in its clutches. Here’s a simple question: if the mind can solve all our problems, why is the world grappling with so many issues, and why are people suffering all around us? The fundamental issue is that the mind denies the existence of a problem. It begins with denial. You have an alcohol problem or a tobacco addiction. But the mind will make you deny the problem. It will justify that so many people around the world drink. So many people smoke. Aren’t they living “normal” lives? So, nothing will happen to me. And so you will pick up another drink and light up one more time! Denial breeds anger. Because despite your denials, the problem persists. So now you are angry. It is like a chewing gum that you has stuck on to your pants and you are fighting to get rid of it. Your helplessness, caused by the gum’s obstinate stickiness, makes you angry. And angrier as time passes. But your denying something or kicking around does not make the problem go away. Whether it is an addiction or a broken relationship. That’s when, besieged by the problem’s refusal to go away, you ask yourself “Why Me?”. Again the same logic from the same mind. So many billion people on the planet, why am I being singled out for this treatment __ be it addiction, be it a relationship, a cancer, a lay off, a business collapse or a scandal that ruins your reputation? Again, after screaming yourself hoarse, asking “Why Me?” for months and, sometimes, for years, you come to a grudging acceptance that the principal reason why the problem persists is because you are resisting it. Grudging acceptance is a good thing. And often leads to fleeting, momentary experiences of peace and bliss. Once you have tasted bliss, you want more of it! And some more of it! Again and again! That’s when, tired and beleaguered of course, enchanted and enamored by the bliss you have experienced briefly, you move towards accepting your situation. From trying methods and attempting solutions, you slip into acceptance. And while the problem remains, confounded and complicated, you feel peaceful. This peace encourages you to review your own Life. And the way you have lived it so far. In whatever problem situation you are in currently, you, for the first time, recognize that you have contributed to it in some measure __ big or small. Acceptance leads you total surrender at this stage. And, in a nanosecond, in a dazzling Eureka moment, you see that for your current reality to change, to transform, YOU must first transform! This, “I must be the change I want to see in my world”, moment is magnificent, magical. And physical personal change alone is not what happens at this stage. Of kicking an addiction or having the courage to walk out on a debilitating relationship. What happens is you change the way you look at yourself. You realize that you are not the body. You are not the mind. And in that state of surrender, deep in the throes of real-Life, real problem, you experience peace, joy and a oneness with creation. That, really, my dear friends, is Bliss. And it need not necessarily be found under a Bodhi Tree! It can be found while reading this post on facebook or in a moment of privacy and solitude on your potty! The literate will call that moment an ‘epiphany’. For the lay person, like you and me, just know that it is the time when you will feel unburdened, unshackled and liberated! And you will not what that moment to ever go away! The question then is, if Acceptance leads us to Total Surrender which in turn leads us to Bliss, all this in such a short span of time, why do we need to, for years at times, deny, fret, fume, kick around, bemoan, grudge, blame in the first place? Why not arrive at the Total Surrender point directly? Isn’t that what basic commonsense would tell you is THE intelligent thing to do? Indeed. It will. And it is. Think about it! 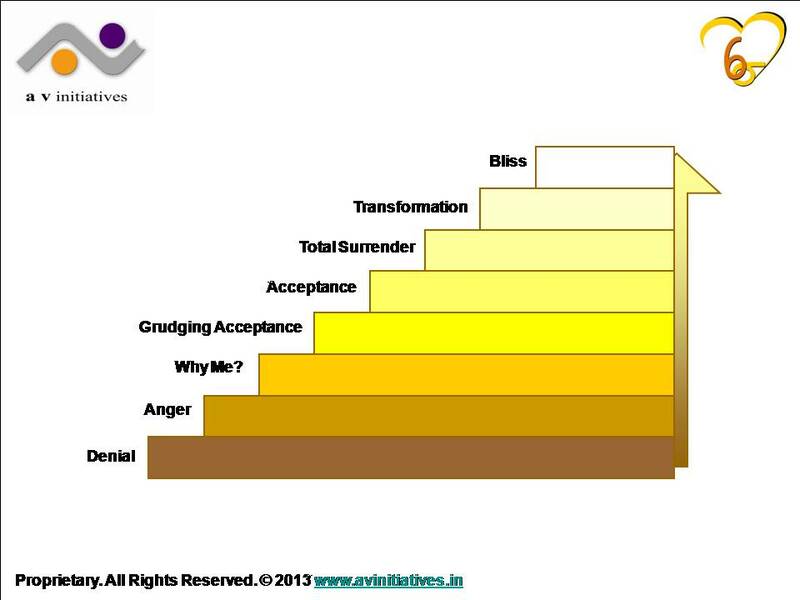 Author AVIS ViswanathanPosted on January 15, 2013 March 14, 2016 Categories Acceptance, Anger, Art of Living, Bliss, Denial, Grudging Acceptance, http://schemas.google.com/blogger/2008/kind#post, Intelligent Living, Total Surrender, Transformation, Why Me?Leave a comment on Why Total Surrender to Life is the most intelligent thing to do!